Carrying galley copy that avoids the h(orror) word while touting its ""O. Henry Award-winning author,"" King's latest novel features a marketing campaign in accord with the distinguished pedigree of his new publisher. But has King written a book that ranks him as a literary heavyweight? Indeed he has, though not by forsaking his roots: the novel is a classic ghost story. It opens quietly as narrator Mike Noonan, 40, bestselling author of romantic suspense potboilers (and latest in a line of King novelist-heroes, cf. Misery and The Dark Half) describes the death of his wife four years back and his consequent grief and writer's block. Mike has kept the block hidden from the publishing world--limned in delicious detail, with real names--by annually pulling one of his own, unpublished mss. from a safe-deposit box. Now that he's out of old novels to submit, he resolves to work through his troubles at Sara Laughs, his country house in backwoods Maine. Arriving there, Mike nearly drives over a three-year-old girl. She is Kyra, granddaughter--by way of beautiful young widow Mattie--of mad computer mogul Max Devore, who is hellbent on snatching the girl from her mother. Taking up Kyra's cause, falling in love with Mattie, Mike gears up for a custody battle. Invigorated, he breaks through his writer's block; but great danger, psychological and physical, awaits, from Max Devore but especially from the spirits, mostly malevolent, that haunt Sara Laughs due to hideous crimes committed by Devore's ancestor a century earlier. Violence, natural and supernatural, ensues as past and present mix, culminating in a torrent of climaxes that bind and illuminate the novel's many mysteries. From his mint-fresh etching of spooky rural Maine to his masterful pacing and deft handling of numerous themes, particularly of the fragility of our constructs about reality and of love's ability to mend rifts in those constructs, this is one of King's most accomplished novels. It is his most personal as well, revealing through Mike's broodings the intimacies of the creative writing process: a passionate gift from a veteran author to all who care about the art and craft of storytelling. 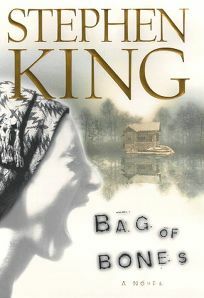 1.26 million first printing; BOMC main selection (Sept.) FYI: Bag of Bones is the only hardcover Scribner will publish in September.